Early any morning for the next two weeks, look for the zodiacal light, a faint cone of light reflecting off interplanetary material along the ecliptic. One of the least known components of our solar system isthe interplanetary dust that fills the disk in which the inner planets revolve.These microscopic dust particles can be seen only under special circumstances.They are very small and very few and far between, but numerous enough to causemost of the meteors that we see streaking through the night skies. They are also visible en masse as a faint haze alongthe ecliptic really dark nights, known as the zodiacal light. The zodiacallight is brightest when we look towards the sun ? when it's not up. Thebest times of the night are just after evening twilight and just before morningtwilight, but even then the light is hard to see. Chances improve at certaintimes of year when the ecliptic is nearly vertical in the sky, particularlySeptember and October in the morning and February and March in the evening. This week we enter the first of two viewing windows for thezodiacal light in the morning sky. 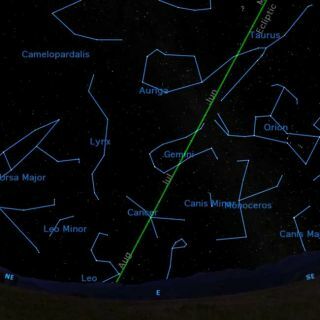 For the next two weeks, it will be visibleabout half an hour before the beginning of morning twilight, forming a huge dimcone of light in the eastern sky. The attached chart marks the ecliptic, where the light isconcentrated, but it actually is a huge glow covering a much larger area ofsky. In fact, the zodiacal light is the third brightest ?object? in the sky,after the sun and moon, with an integrated magnitude of ?8.5 but, because it?sspread over such a huge area, it is impossible to see with any optical aid, andonly visible with the naked eye with difficulty. Strangely, it?s possible forsomething to be too big to be seen. The zodiacal light is easily mistaken for the Milky Way,but this is a good time to observe it because the zodiacal light is aligned upand down in the sky while the milky way runs almost horizontally at this timeof the year. If the zodiacal light is hard to see, the Gegenschein iseven harder. ?Gegenschein? is German for ?counter-glow,? and refers to theconcentration within the zodiacal band directly opposite the sun in the sky.Like the lettering on highway signs, the area of the zodiacal band directlyopposite the light source (the sun) glows brighter than the rest. Very few astronomers have ever seen this, but it?scertainly worth trying for, if you have a truly dark observing site. Here youmust wait until local midnight, so that the sun is directly beneath your feet.But that is a target for another time, as it is best observed on a moonlessmidwinter night.